Thank you so much for commissioning me! Thank you so much! So beautiful. The detail is incredible, especially with the reflection in the glass and the city among many other things. 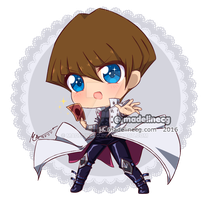 Kaiba can be a hard character to draw. My most recent drawing of him is of him as a cat. It was quite hard, because I keep erasing many parts of the drawing. The concept of a cafe like this is amazing. I always enjoy nights quite a bit. The background is wonderful and breathtaking. I love how Kaiba is leaning forward. Nice work. He can be >_< Even as a cat! Hehehehe...in my drawing he isn't a happy cat.